The best knives under $50, how to make one of the industry’s hottest folders, and two custom knife industry veterans doing their best to protect elephants and your legal ivory are among the highlights of the new BLADE®, on newsstands now! The best knives under $50 and more highlight the new BLADE®, on newsstands now! Sandra Brady and Linda Karst-Stone are known throughout the custom knife industry as two of the best scrimshanders. They have a vested interest in the nationwide attack on legal elephant and ancient ivory by the federal and state governments. If you think all Sandra and Linda care about is their livelihoods and not the plight of elephants and the state of legal ivory, you would be wrong. Find out what the federal and state grab on legal ivory is really about in the “Dynamic Duo of Ivory” by Pat Covert. 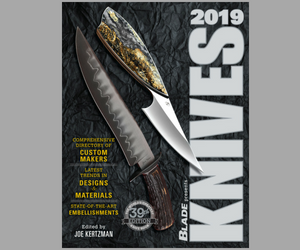 Also this issue: tests of the latest hatchets, neck knives and two new folders, those who forge damascus in quantity for use by other knifemakers and companies, 41 reasons you may be an edgeneck and much more in the latest BLADE.